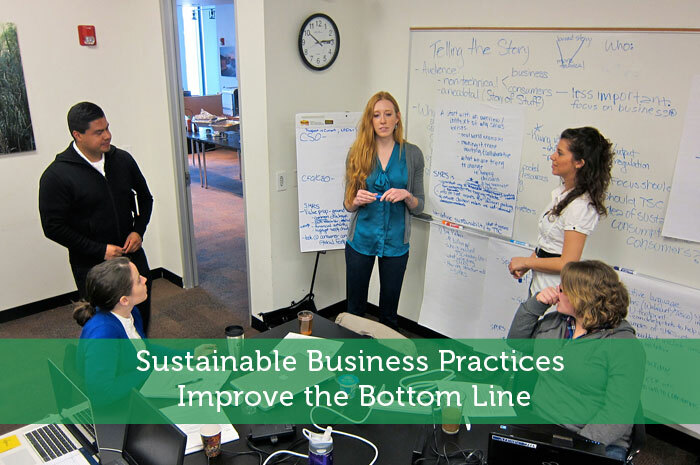 Sustainability is a term that centers around efficient business practices. Most people attribute it to the definition of “green” practices or eco-friendliness. However, sustainable business practices go beyond saving the planet as it can also save your business. Keeping the waste reduced in the business atmosphere obviously saves the company money. However, there could be more at risk than that of paper and consumable products. Time is one of the most wasted aspects of business and can be attributed to inefficient practices and procedures within the business dynamic. Even marketing strategies could be wasting revenue without proper data analysis of working methods. Improving overall efficiency in the workplace can decrease waste in various forms which may enhance business practices. Bulbs, energy star compliant equipment and motion-sensing light switches can make an impact within the business. Properly shutting down monitors, printers and other “hibernating” devices can take it a step further. If you’re looking for a way to save energy in the workplace, power socket meters are capable of demonstrating the amount of electricity various appliance consume. These devices will record every volt traveling out of the power socket into the appliance. This unit can help you find problem areas while displaying how much money and power is used even if the equipment is not in operation. Corporate Social Responsibility, or CSR, is an ideal that is integrated into the business model of maintaining a responsible social presence within the community. This could include practices such as self-regulating hazardous waste and implementing methods that deliver less of a negative ecological impact to the location. For example, platforms developed by Sukanto Tanoto improve on socio-economic situations enhancing the way of life for all involved whether it’s employees or those living near manufacturing plants. By demonstrating a corporate conscience, business owners can also improve relations within the local community. Since the development of computer systems, data analysis has never become more intricate and diversified. Using collected data can help commit the business to more sustainable practices while demonstrating the financial impact of those decisions. By analyzing the data, business owners can determine if certain strategies are efficient and cost effective while identifying problem areas. For instance, analytical information can help you determine which of your advertisements are more effective in driving visitors to your website. Depending on the solution you’re using, it may also be capable of showing you the demographics of visitors such as gender and age. Once this information is collected, you could attune future marketing strategies in order to maximize the effect for your target audience. Having the right tool for the job can save time and money regardless of the task. It is this viewpoint that can improve efficiency through the equipment used within the company. New and innovative technologies may be able to provide that perfect tool for the job while being less costly than you may realize. By moving to efficient and sustainable practices, your business could save money while improving overall productivity. It’s not a matter of whether or not you believe in global climate change, but whether or not you want to improve your bottom line. Being conscious of the world around you can attribute to health, prosperity and financial growth as long as you’re willing to do what it takes to implement change. It makes sense that there could be a pretty good crossover between sustainability and cost — after all, using less of anything will definitely cost less than using more of it. Most experienced Search Engine Marketing Solutions in optimizing and making websites more visible on internet. Catch that page rank you’ve always wanted. With knowledge of programming languages, excellent writing and communication skills so you will be assured that your business is always on top of competition. Waste reduction does help business succeed. At our office, aside from helping environment for waste reduction, when people are idle or have no work to do, we ask other departments to send some work or give our employees other training like by reading work specifications of other projects and learning tools so that when time arises that such project needs manpower, our employees are ready and efficient enough to handle related tasks.